LexisNexis®, a leading provider of content and technology solutions for legal, corporate, tax, academic and government markets, released ‘The Chief Justice Speaks: Selected Judicial and Extra-Judicial Reflections of Justice A.M. Ahmadi’, at Indian Law Institute in New Delhi on October 21,2016, evening. 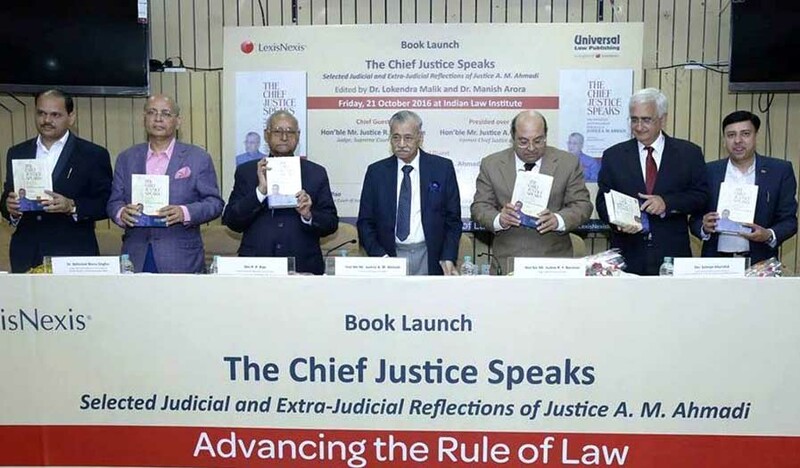 Hon'ble Mr. Justice R. F. Nariman, Judge, Supreme Court of India,who was the Chief Guest of the function, released the book in presence of Guests of Honour: Shri P. P. Rao, Senior Advocate, Supreme Court of India; Shri Salman Khurshid, Senior Advocate, Supreme Court of India; and Dr. Abhishek Manu Singhvi, Senior Advocate, Supreme Court of India and Member of Parliament, Rajya Sabha. Hon'ble Mr. Justice A.M. Ahmadi, Former Chief Justice of India,also presided over the event in presence of many other eminent members from the bar, corporate and media.